Sacred Heart Home for Incurable Cancer, located at 1315 Hunting Park Avenue in Philadelphia, has been run by the Dominican Sisters of St. Rose of Lima (Hawthorne) since 1930 but will suspend operations at the end of August. An era will end in Philadelphia, hopefully temporarily, when Sacred Heart Free Home for Incurable Cancer suspends operations at the end of August. 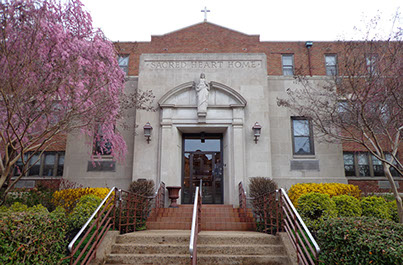 The 25-bed ministry of the Dominican Sisters of St. Rose of Lima (Hawthorne) has been located at 1315 Hunting Park Avenue in North Philadelphia since 1930. Sacred Heart is unique in that it relies entirely on donations and accepts no money from its residents or any government agency, not even Medicaid or Medicare. It exists entirely on free-will donations. This is in keeping with the charism established by the congregation’s founder, Mother Rose Hawthorne Lathrop, a Catholic convert and widowed daughter of distinguished author Nathaniel Hawthorne. She established her first small hospice for incurably ill cancer patients in New York City in 1896 and her congregation in 1900, and at that time adopted her name in religion, Mother Alphonsa. She died in 1926 and the cause for her canonization is in its early stages. In addition to Sacred Heart in Philadelphia the congregation has a larger facility in Rosary Hill, Hawthorne, N.Y., and another in Atlanta, Georgia. “We have 10 sisters here,” said Sister Mary de Paul, O.P., the director at Sacred Heart Home and herself a Philadelphia native. Most of the sisters are trained nurses, but one of the challenges for Sacred Heart is that with a reduced number of sisters, there is an increased reliance on lay staff, which because of higher payroll increases costs, Sister Mary de Paul said. Homes conducted by the Rose Hawthorne Dominicans are never large and this is in keeping with the will of their foundress. The smaller size gives a more personal, less institutional feel. Because the focus is on palliative care the residents who come do not receive hospital treatments to eradicate their cancer, just such medications needed to keep them comfortable. All services including doctor visits are done in-house. With that said, residents tend to live longer than in past years, probably because of medical advances even in palliative care. As for why Sacred Heart Home is suspending operations, a release issued from the congregation explains one factor contributing to the decision was the sisters’ concern “to preserve and foster their charism in its entirety. Consolidating the number of homes operated by the sisters will enable them to maintain the personal bedside nursing care which is an essential element of their apostolic charism. While their numbers are not high, the Rose Hawthorne Dominicans are not dying. “We have two postulants right now who will take vows in September and we have three girls entering in October,” Sister Mary de Paul said. To learn more about the Dominican Sisters of Hawthorne visit the website Hawthorne-Dominicans.org. My sister entered into eternal life there, with the sisters at her side. This home is so unique, not only do they do Christ’s work here on earth, they have a beautiful chapel where Mass is said and a kitchen for homemade meals. My sister received the best care anyone could receive, love and comfort with not a penny of cost to the patient or family members. God bless these remarkable Sisters. I have little excess to make donations but I donate to Sacred Heart! My fondest memory is of a sister sitting with a dying homeless woman singing to her. I am sorry to hear that they are closing, and hoping and praying that it is temporary. Years ago when working on my MSN, I visited the Sacred Heart Home with a classmate of mine because, at that time, it was one of the few examples of a inpatient hospice in this country. My classmate was the wife of a Protestant minister, and she couldn’t say enough positive things about the care of the sisters. She was most impressed about the peace and serenity of the place, especially in the chapel. Thank you, sisters. That one brief visit has been remembered fondly more than once. This is very sad news. One of the Sisters visited my students at St. Hubert High School. What a sad loss to the Archdiocese. They are a great group of women who are TRUE daughters of the Church. I hope and pray that they will come back. Their work and presence is very much needed.